This stunning 18ct gold diamond ring from The Forever Diamond collection, exclusive to H.Samuel, has a total diamond weight of 0.38 carat. The Forever Diamond has a unique flower cut made up of 73 facets, the result is exceptional sparkle and radiance. Each Forever Diamond has been independently certified by the GSI for colour, clarity, carat and cut. It's your guarantee of quality and beauty. 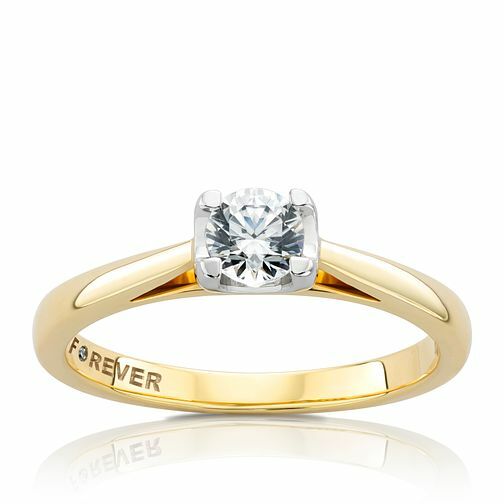 18ct Gold 0.38 Carat Forever Diamond Ring is rated 5.0 out of 5 by 1. Rated 5 out of 5 by Anonymous from Simply beautiful I received this ring for my 40th birthday from my husband seven years ago. It is absolutely gorgeous. The colour and clarity of the diamond is first class. Even though it was sold in the category of 38 points mine actually comes in at 44 points. The diamond colour of mine is a G. Really sparkles especially in sunlight. I would definitely recommend this ring.